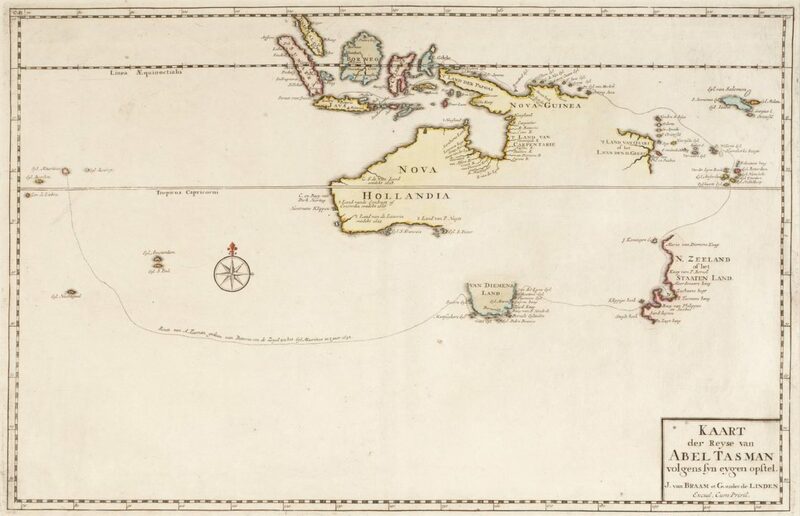 Tasman’s journey was remarkable for many reasons, not least because it was an incredible feat of seamanship through uncharted waters, completing a round trip that started in Batavia and included Mauritius, Van Diemen’s Land, New Zealand, Tonga and New Guinea. All of this in an era before reliable calculation of longitude (it would be another 100 years before the maritime chronometer was perfected) or the invention of the sextant. A new exhibition at the Tasmanian Museum and Art Gallery, ‘Through Tasman’s Eyes’, takes the visitor back to the world of the mid-17th century, when Spain, Portugal and the Netherlands vied for control of the lucrative spice trade across the world’s oceans. 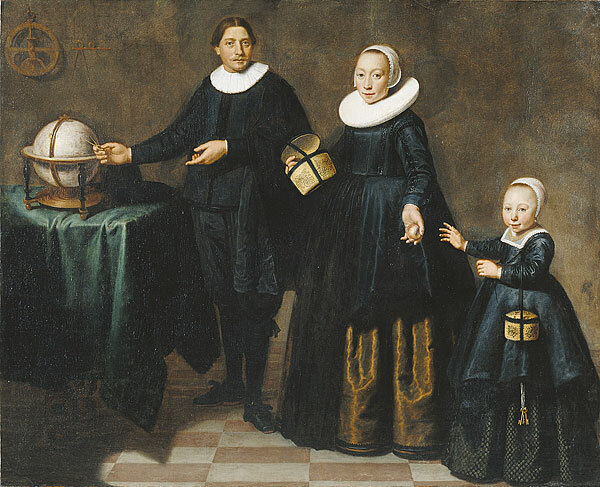 With stunning prints of rare documents from the Dutch National Archives and the Scheepvaartmuseum (National Maritime Museum) in Amsterdam, the exhibition takes you into a different time, when much of the Southern Hemisphere was a mystery to European explorers. The exhibition is an introduction to Tasman’s story, which will be expanded into a larger exhibition ‘The Early Dutch Explorers’ scheduled to run concurrently with the MyState Australian Wooden Boat Festival in February 2017, before travelling on to New Zealand later in that year. Both exhibitions are linked to the website tasman1642.com.au, which explains the background to Tasman’s extraordinary journey. A brilliant interactive map by New Zealand author Dave Horry allows you to zoom in on Tasman’s route map and read his actual journal entries for each of his major positions. The exhibitions are generously supported by the Embassy of the Kingdom of the Netherlands, Dutch Culture and the Shared Cultural Heritage program and by the Allport Bequest. We will welcome more than 30 visitors from the Kingdom of the Netherlands to the MyState Australian Wooden Boat Festival in February 2017. Seven more are already with us, working on the Dutch Boat Project at the Wooden Boat Centre in Franklin. While we have provided accommodation for many of them, we know that home stays with local Tasmanian friends and families are a very rewarding way of enriching their experience. It could be that you have Dutch heritage, or that you are interested in the remarkable wooden boats our guests will be bringing out with them, or just that you enjoy meeting new people and showing them what a beautiful place we live in. Perhaps you have received hospitality in another country and you would like to return the favour. If you would like to open your home to one or more of our Dutch visitors, we have an easy way to make that happen: just contact the AWBF office on (03) 6223 3375 or email us at info@australianwoodenboatfestival.com.au to register your interest. We’ll do our best to match you up with our Dutch guests. Most will arrive on 7 February, 2017 and stay through the festival, departing the following weekend on 18 February. You don’t have to host a Dutch visitor for the whole period; we’re asking for a minimum of three nights’ accommodation, whenever you like. You probably know that almost all Dutch adults and children have an excellent command of English and you might even learn a few words of Dutch before they go home! Almost all of our guests will take part in Festival activities, including sailing, children’s entertainment and an interesting project to trace Dutch heritage for Tasmanians with links to the Netherlands. That means that daily access to the festival site will be important, so if you are on a public transport route or within an easy taxi ride of the Hobart CBD, we’re interested in talking to you!